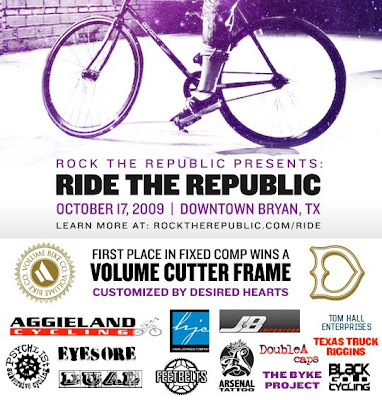 Rock the Republic is a 3-day (Oct.15-17) music and art festival in downtown Bryan, which is adjacent to us in College Station. They are calling it a "Spectacle of Sight and Sound". There are tons of different live bands playing, all of them being from Texas. There is also a stomp competition, a benefit walk, and slam poetry. The cycling events are the main events for Saturday the 17th. There is an alley-cat race starting around 2 pm, followed by live music during the bmx and fixed freestyle comps. The map for the race will be posted sometime this coming week on Third Coast Fixed. The local 20" guys are building I think 3 quarter pipes, a wedge, a grind box, and they will be bringing their huge lake jump ramp also.